Recently, I was given an opportunity to attend a complimentary class at the Butcher and the Burger. Our subject, an Ossabaw Hog. The hog was from a local farm that the Chef and his partner frequently work with and know well. According the Chef Allen Sternweiler and partner Josh Woodward, who led the class, all the animals they use in their burgers and butchering classes are humanely killed and well cared for throughout their lives. Being a big animal lover, and also a person who appreciates a good steak and/or burger, it’s always reassuring to know where the animal you’re eating comes from and that it was well-cared for. Chef Allen started off the class by explaining a little bit about the type of hog we’d be working with. The Ossabaw hog is a heritage breed, which developed insular dwarfism (meaning they are smaller than most hogs butchered for their meat), due to years of an isolated existence on Ossabaw Island, Georgia. The species is descended from the dark pigs brought over by the conquistadors over 400 years ago and has a unique characteristic in its ability to store large amounts of fat to get through the sparse winter, making it a highly marbleized meat with unparalleled flavor. I wasn’t exactly sure what to expect from the class, especially never having seen a butchering before. I’m not sure if I expected the animal to still have a face, hair, or what, but was relieved to know that all the dirty work had already been done for us. The act of butchering isn’t actually killing the animal, but is breaking the animal down into different cuts of meat. It was a lot less “scary” than I had expected. Having read The Jungle, by Upton Sinclair I was excepting something much, much worse. The whole process was clean, fright-free, and an excellent experience for not just aspiring chefs and BBQ enthusiasts, but anyone at all who is a meat-lover. It was super cool to see where on the animal certain cuts of meat come from. First, Chef Allen showed us how to separate the “tenderloin” from the animal, and as he worked at removing the cut of meat it became more and more like what one sees at the grocery store. Although, this hog had been slaughtered that very morning and therefore was extremely fresh. So fresh in fact, that after Chef Allen had finished removing the tenderloin from the hog he asked the guy standing next to me to please pass him the salt and pepper. Everyone in the class was quite confused and I began looking for some source of heat, but there was nothing in sight. Next, he lopped of a sizable hunk of the tenderloin, salt and peppered it and popped it into his mouth, completely raw. I’ve had beef tartar before, but never raw pork tenderloin, I was slightly mortified, but also intrigued. Then, he proceeded to tell the class that we were all going to try it. He cut off smaller bites of the tenderloin, salt and peppered them and passed them around the classroom. One by one, each of the students began popping it into their mouths, and yet no one looked like they were going to vomit and most had pleasant appearances on their face. When my turn came around, I selected the smallest piece I could find and popped it into my mouth, took two or three bites and swallowed. It actually tasted quite a bit like fresh, raw sashimi or tuna. It was buttery, not too chewy, and didn’t have an unpleasant taste in the least. So when the raw, (but cured and smoked) bacon came around I happily popped that into my mouth as well. This is where bacon really comes from! Chef Allen certainly doesn’t recommend chopping off a piece of raw tenderloin you find prepackaged in the grocery store, because you don't know exactly where it comes from. But, because he knew exactly where the animal came from, had previously met that same animal on the farm, knew exactly what time it was slaughtered and how it was transported, he deemed it safe. As a chef with quite a bit of butchering and meat experience I really trusted him. For me the class was very enlightening. I'd love to be able to purchase all my meat from local farmers, but the class won’t stop me from purchasing meat from a grocery store. Because I work for a food science association, I know that the utmost care is taken to be sure that from farm to table, consumer’s food is safe. While it would be wonderful to always know where exactly my food comes from, that isn’t a possibility for most people, including myself. The class watched as Chef Allen slowly broke down other parts of the animal, showing us where the ribs were taken from, the rib tips, the bacon or belly of the pig, the chops, and more. 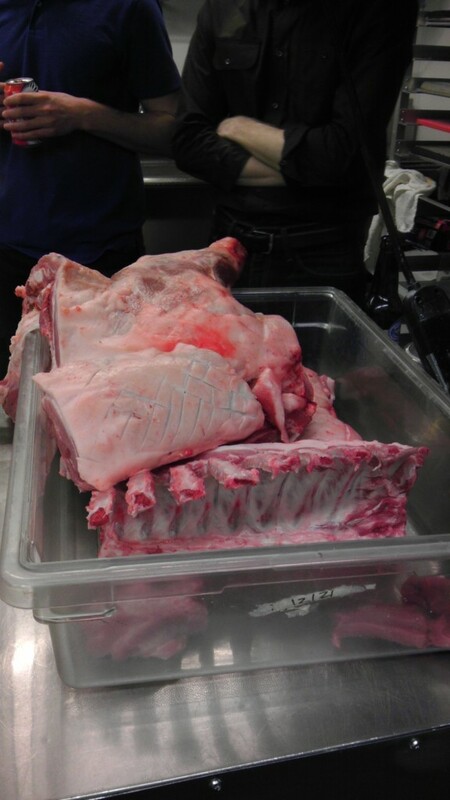 Chef Allen also saved parts of the animal that weren’t going to be turned into specific cuts of beef, throwing them in a large tub to use later for sausage making. It was reassuring to me that very little of the hog was going to waste, and every piece had a place. At the end of the class, a large discount was given to anyone who wanted to purchase a specific part of the very hog that we saw broken down. Unfortunately since I live in a small studio apartment, and don’t have a large kitchen or an outdoor grill to use, I found it wouldn’t be worth it to take a piece of the animal home. But, for those of you out there who do have a grill or grill pan, I highly suggest taking a part of the animal with you when you leave the class. The class concluded with a homemade pork burger and fresh French fries. I’d never had a pork burger before, and was surprised that it tasted very similar to beef, if not more delicious. I absolutely can’t wait to come back to this Lincoln Park burger joint to experiment with different burger flavors and hopefully take more classes. If you’re interested in seeing their upcoming classes you can visit their website and see the different dates in which you can filet a fish, break down different types of game animals, butcher a steer and more. The classes aren’t hands on, because working with a sharp knife and butchering a whole animal is definitely a skill that needs to be honed and practiced. But, Chef Allen’s instruction and demonstration are a great start for anyone interested in butchering, sustainability, and learning where your food comes from!